Having said a few weeks back that I rarely travel too far west of Hwy 217, I find myself venturing in that direction again for the third week running. 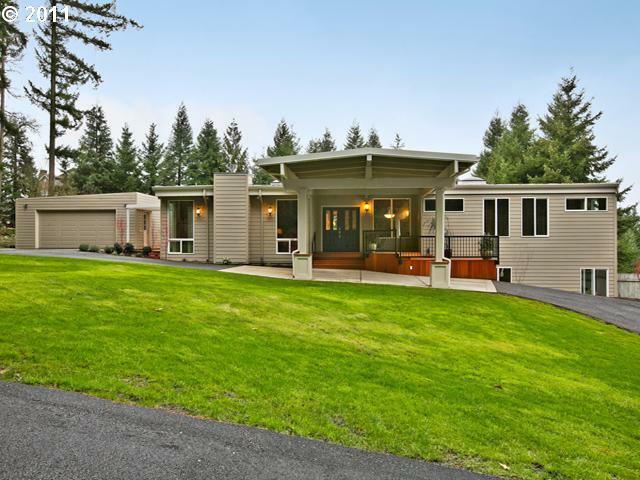 This time to a sensational 1976 Northwest contemporary, remodeled and listed at $929,000. Situated on .84 of an acre, and with the front of the house facing a wooded green space, this property leaves one with a strong sense of privacy despite being virtually surrounded by sub-divisions. Sense of space though is what this house is all about, from the vast lot to the 4542 sqft of the interior and while this is a generous space, it’s elegant not extravagant. Not being extravagant or indeed downright vulgar is what sets this house apart from so many of its peers. The interior work and finishes have been executed with such subtlety and taste that there is no fear of having to suffer the previous owner’s questionable palate. Quite the contrary, and that’s a refreshing a change. The main level boasts a formal living room and dining room, and a huge kitchen with adjoining family room complete with fireplace. Both the kitchen and family room access the substantial deck through sliding doors. Further down the house are three of the five bedrooms including the master bedroom. Throughout the main level are natural wood vaulted ceilings that really set the tone of each room. Downstairs there are the remaining two bedrooms and an almost 500 sqft bonus room, ready to be turned into a media or games room. It does seem like it’s some distance from downtown Portland but we clocked roughly 15 minutes coming back via Cornell Road which frankly is not too bad. So, if a large private lot with a sizable Northwest contemporary is what you are after, this might just be the one you are after.